Aside from the state meet next weekend, Saturday’s class championships is the biggest day of the season for R.I. high schools with every team from the state converging at Ponaganset High, ready to attack 3.1 miles of real estate on the Chieftains’ covered-bridge trail. No matter how you look at it, this is the state meet. What you see in this race could mirror next weekend with three of some of the best schools in the state scheduled to duke it out, including heavy-favorite La Salle Academy and defending class and R.I. champion Bishop Hendricken. On paper and based on what they’ve accomplished already this fall, the Rams should earn the hardware, and fairly convincingly. La Salle’s five scoring runners have clocked 15:45 or faster and are listed among the top six on MileSplit RI’s rankings. The Rams have proven that their depth runs strong, too. Without one of their top harriers, junior Jack Salisbury, La Salle still managed to take the elite division of the Great American X-C Festival in early October. Salisbury, who is dealing with a sore quadricep, will not be on the line Saturday. But according to assistant coach Bill Myers, he will be back in time for the states next weekend. Right now, look for sophomore D.J. Principe and junior teammate Matt Bouthillette to take charge up front with either of them capable of breaking the tape at the end. Principe has the fastest time in the field at 15:27.51 with Bouthillette a few seconds behind at 15:31.71. 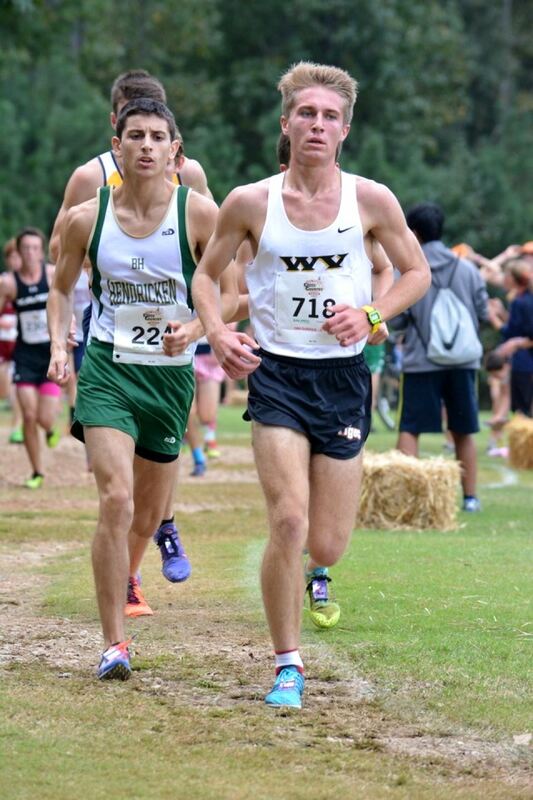 Junior Jake Grundy (15:44.52) and senior Dan Paiva (15:45.93) are also capable of placing with the best. Even though the odds are highly favorable for a La Salle victory, you can never count the Hawks out. Head coach Jim Doyle has been around long enough and knows how to get his squad ready for a peak performance during the championship season. Hendricken won the seeded section of the Great American and was seventh overall. Like the Rams, the Hawks are also well-rested after taking this past Saturday off from racing. Senior Michael Potter has been a consistent No. 1 all season for Hendricken and could be battling up front for individual glory. Junior Dominic Parlato has come on strong this season, improving on his best from last year by nearly 40 seconds with his 16:04.80 effort at the Great American. 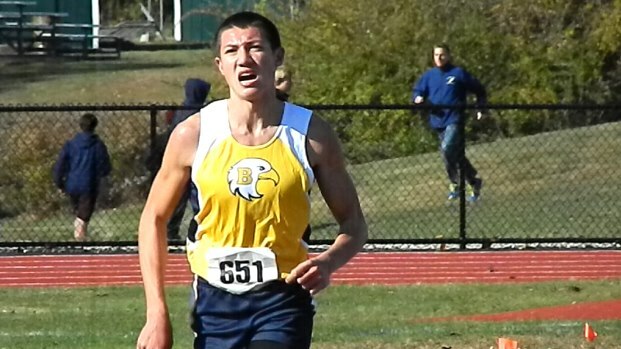 Hendricken’s next four runners are all within 12 seconds of each other, beginning with Avery Ingegneri’s 16:20.20. We all know the effectiveness of pack running and that will more than likely be the strategy utilized by the Hawks to try and pull off the upset. You can’t dismiss a talented Cumberland squad of pulling off runner-up honors. The Clippers, undefeated during the dual-meet season in the Northern Division, will need their ‘A’ game to make it happen. Junior Sean Laverty is certainly capable of breaking the party up front. At the Brown Invitational this past weekend, he ran an all-time best of 15:39.54 to move to No. 3 in the state rankings. He will have to run a time close to that on the Chieftains’ more-challenging terrain to finish among the top five. Cumberland has five runners that have dipped under 17 minutes this season and that’s not including senior David Agudelo, who ran 16:59 last year and had been sidelined for a few weeks this season with health issues. Senior Abdullah Kaba, who is ranked tenth in the state, has been a steady No. 2 for the Blue and White lately. He ran an all-time best of 16:18 at Brown last week. Again, the Clippers will have to put their best feet forward to have a chance at second place. Barrington, a team with potential to crack the top six at the state meet, is a clear No. 1 in this race. The Eagles have a strong contingent that’s led by the trio of junior Grant Auber (17:05.97), sophomore Mars Bishop (17:14.34) and senior Lucas Bledsoe (17:15.16). Toll Gate, Portsmouth and North Providence have the ability to make it interesting. The three squads may not be able to match the talent of the Eagles, whose top seven runners rank among the top 25, but all three are fairly equal against each other. Individually, Classical junior Joe Murphy has the target in his singlet. He owns the top seed with his best of 16:23 at last week’s Brown Invite. Murphy also ran 16:36 at the season-opening Injury Fund Carnival. Toll Gate’s Daniel Mowry (16:45.56), North Providence’s Noah Coogan (16:50.22) and Portsmouth’s Patrick Hook (16:59.12) have also broken 17 minutes this season. East Greenwich coach Peter Dion stated a few weeks ago that if his team didn’t finish at least third at the state meet it would be a disappointment. His Avengers could certainly achieve that placement next weekend with their level of talent. At the class meet, it looks like the Avengers should coast to an easy victory. 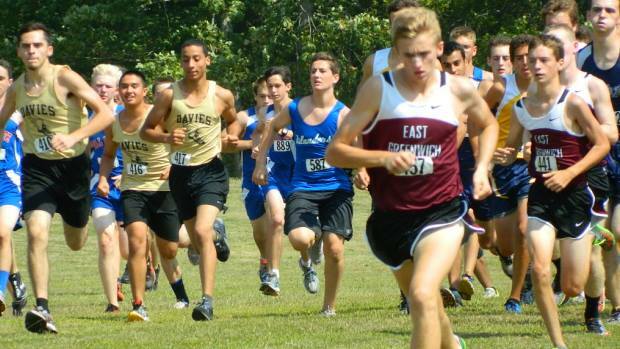 East Greenwich has all seven of its runner ranked among the top 13 with the top two slots occupied by seniors Tommy Sommers (16:15.76) and Noah Barreto (16:16.25). In the Championship race of the Wickham Invitational a few weeks ago, E.G. finished a strong fourth overall against the high quality of teams in the field. East Greenwich followed that performance with a dominating 36-76 triumph over second-place Smithfield at the Bronco Invitational. Scituate was third with 81 points. The Sentinels and Spartans should be the Avengers’ toughest challenge, and based on last week’s Bronco Invite, it shouldn’t even be a challenge. This will be a good tune-up for the Avengers for next week. Don’t expect PR performances from the E.G. runners, who will more than likely run fast enough to make it happen, while conserving their energy for bigger and better things the following week.